A pair of marvellous Neolithic chambered cairns stand on a sloping hill looking south over Wigtown Bay. As best we can guess, the cairns were erected sometime around 4000 BCE. The first monument you come to is Cairn Holy I. 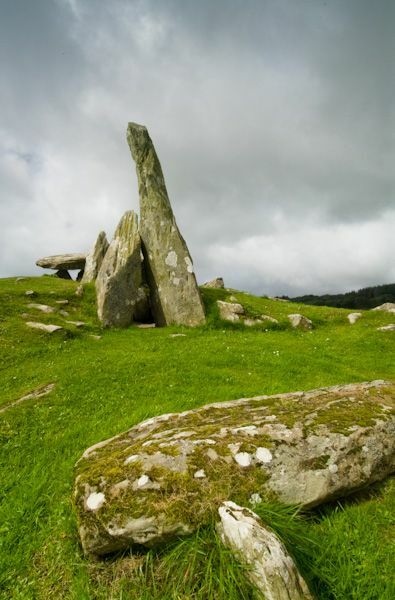 This is of a type common in the region of south-west Scotland, called 'Clyde type' tombs. 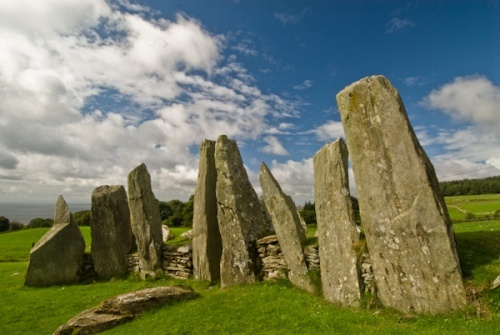 The cairn measures roughly 170 x 50 feet and is fronted by a crescent-shaped facade. 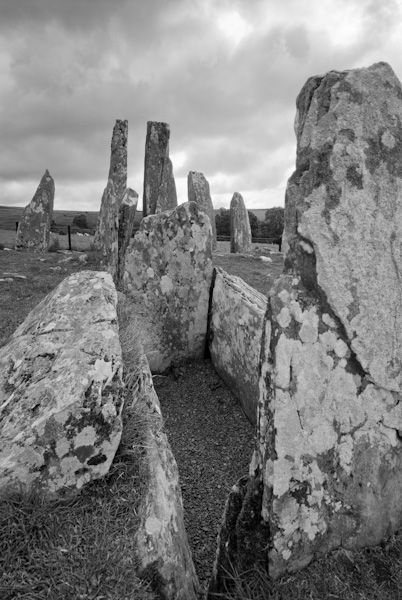 Behind the facade, guarded by slender standing stones, is a ruined chamber in two sections. In the outer section a jade axe, imported from somewhere in the Alps, was unearthed (it is now in the National Museum of Antiquities). A blocking stone originally defended the inner chamber. 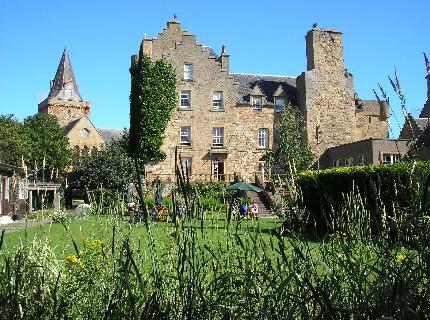 It is likely that the inner chamber was the original, and that the outer chamber, facade, and forecourt were added later. Note the cup marks on one of the facade stones guarding the entrance to the cairn. Other finds within the chamber include Neolithic pottery sherds, an arrowhead, and later pottery and a flint knife. There were further pottery sherds in the inner chamber, with a cup-and-ring marked stone. A short walk from the first cairn brings you to Cairn Holy II, another Clyde type cairn. 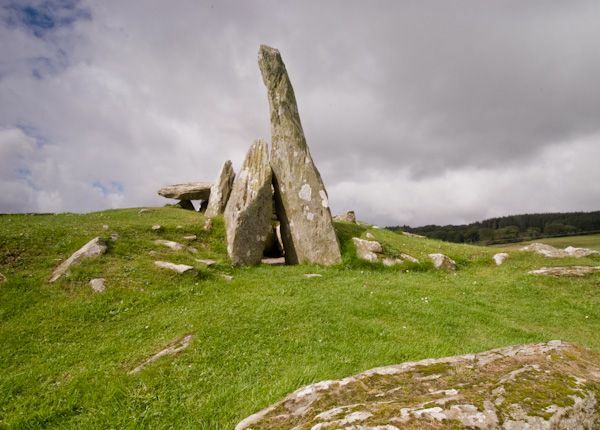 Legend says that Cairn Holy II was the burial place of Caldus, or Galdus, a legendary Scottish king, a sort-of Scottish King Arthur, if you will. Because of this association, some people come to Cairn Holy II to light candles or leave small offerings like flowers. This is a smaller monument, measuring 70 x 40 feet, and never rising to more than 2 feet high. 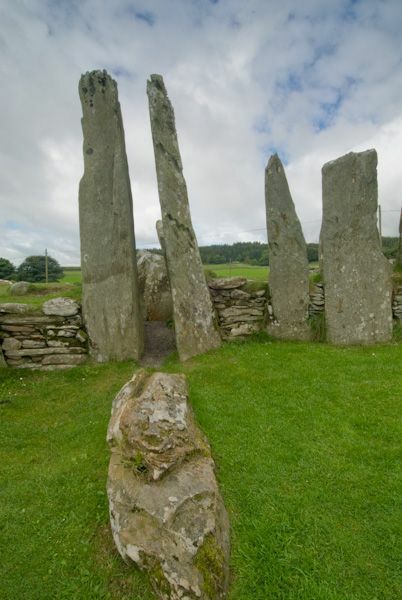 Again, there is a twin-chambered interior, behind a shallow forecourt, much less impressive than Cairn Holy I. Finds from the inner chambers were sparse, as the grave had previously been robbed, but an arrowhead and flint knife were found, with more Beaker type pottery sherds. 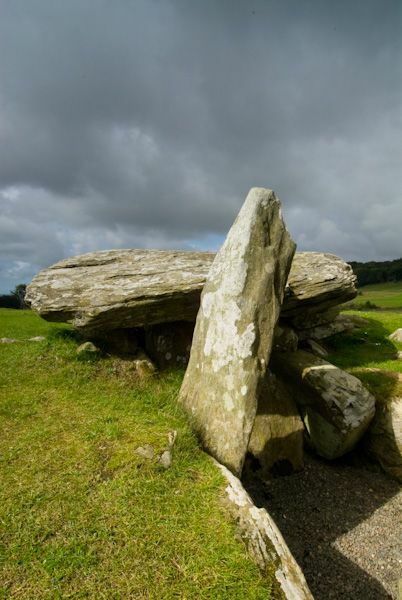 The ambience at this site is quite wonderful, and it is well worth making the trip to see the cairns. 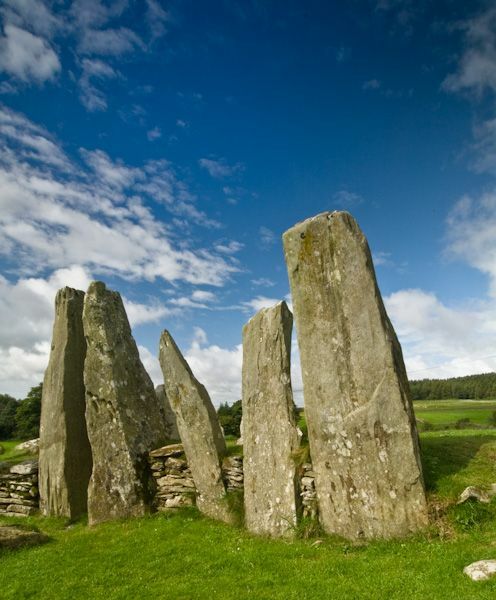 My favourite is definitely Cairn Holy I, with its curving shield of standing stones forming a guard of honour for the inner chambers. Location: 7 miles south east of Creetown, exit north on a minor road off the A75. Signposted.